I saw The Last Pig documentary at Red Robin Song Animal Sanctuary and Guest House in New Lebanon, NY on Dec 3, 2017. 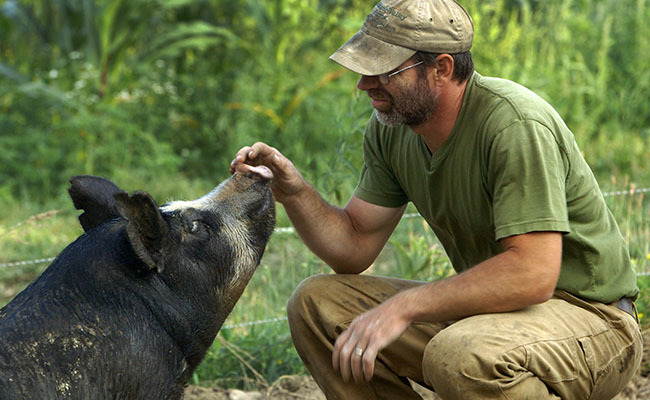 The film brilliantly follows farmer Bob Comis through his last year as a humane pig farmer. 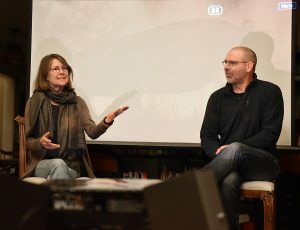 Not known to the almost 50 guests, the film’s director Allison Argo and Bob himself were in attendance and answered questions after the film was shown making the evening unforgettable! Bob grew up in suburban Syracuse and attended Syracuse University, where he played on the varsity lacrosse team and planned to become a physician. He majored in biology and did well academically, but was not happy and dropped out. He later enrolled at SUNY Binghamton, where he met his future wife. He switched majors from English to philosophy and graduated at 29 from Temple University with a degree in political science. He and his wife, Jennifer, moved to Schoharie in 2004 where he raised black-and-white Berkshire pigs on 70 acres. He aspired to the highest possible welfare standards as a pig farmer. Of the more than 2,000 pigs he sent to slaughter in 10 years as a pig farmer, he sold most of his pigs wholesale to Dickson’s Farmstands Meats, a boutique shop for humanely raised meat and poultry in the Chelsea Market in Manhattan. He came to know their emotions from their sounds: grunts of contentment while grazing, ear-piercing squeals in times of distress and long, low groans when separated from the group and he had an epiphany-“When I realized that the pigs’ beingness connected them to me was when I decided I couldn’t do it anymore”. He became vegan and decided to start a veganic vegetable farm! He was able to give six pigs to animal sanctuaries: Audrey and Mario to the Catskill Animal Sanctuary; Gus and Roxy to the Farm Sanctuary in Watkins Glen; and Lila and Brutus to Rooterville, A Sanctuary in Florida. Bob kept a journal of his experience and feelings as a pig farmer . A friend of film director, Allison Argo sent her one his essays he wrote for the Huffington Post, “Happy Pigs Make Happy Meat.” She read dozens of his posts and decided he’d make a great subject for a documentary. For a year, Argo and cinematographer Joseph Brunette filmed Bob on his farm as he transitioned from pigs to vegetables. During the course of filming, Allison found herself so moved by Bob and his story that she, too, became a vegan! “The Last Pig” was completed in 2016 and is currently being screened at venues around the world. It is a truly magical retelling of Bob’s incredible journey from humane pig farmer to being vegan and raising veganic vegetable! A MUST see!